Whether your trousers are part of a suit or a standalone pair of chinos, cords, or even jeans, the same basic rules of fit apply (exception: denim can get away with being a little tighter). Follow the steps below to see how well they fit. 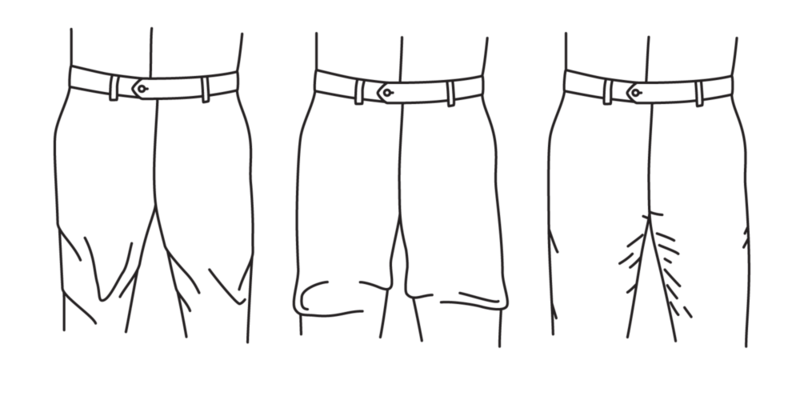 The waist should not be tight enough to strain fabric (left), but it should not be loose enough to appear baggy (center). It should leave enough room to insert one to two fingers (right). The waist should stand up on its own without needing a belt, but should never pinch you when sitting down. You should be able to fit one to two fingers into the waistband without too much trouble. But know that it’s more than just a comfort issue: a waist that is too tight can cause pulling in other areas, and an oversized waist will cause bagginess in other parts of the garment. The hips should not be so tight as to cause pockets to "bow" (left), or too loose to leave excess fabric (center). There should be a half-inch of fabric on either side of the hip (right). 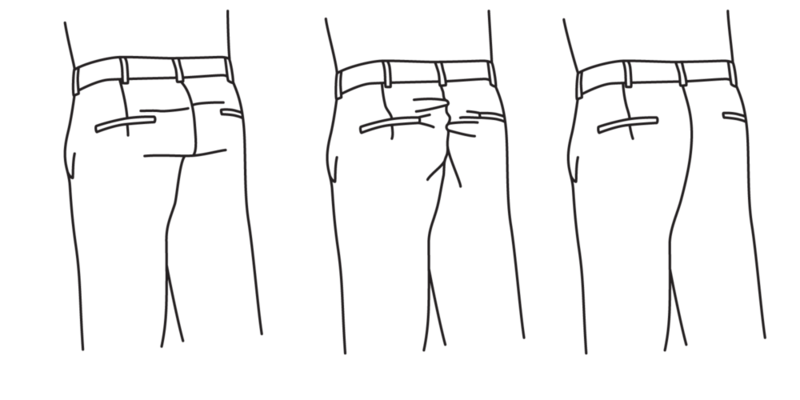 It’s time to learn a new phrase: “pocket bowing.” Are the pockets of your trousers pushing out on each side, as if you just had your hands inside them to frantically dig for change? If so, the hips of your trousers are likely too tight. You should be able to pinch a half-inch of fabric on each side of the hip. 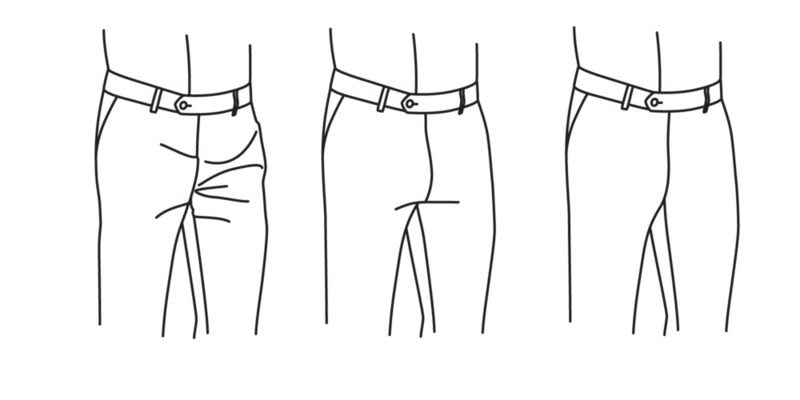 The rise is the distance from the middle of the crotch seam (directly between the legs) to the top of the waistband. The whole front should fall flat against you while standing—if there’s any “whiskering” or straining, you’ve got a problem. The drop should not be so high as to cause straining (left), and should not be so low as to leave excess fabric (center). It should fall flat without bagging (right). As you might imagine, the drop is the opposite of the rise: it runs from the back of the waistband to the middle of the crotch seam. A drop that is too low results in excess fabric: a drop that is too high is causes discomfort. For the best fit, you want a drop that’s high enough to avoid looking baggy, but low enough to keep you comfortable. A seat that is too tight will cause fabric to strain (left), and a seat that is too loose will appear saggy (center). It should fall flat without straining or sagging (right). The seat should never be so tight as to strain the fabric. But you also want to avoid any excess fabric that will give it a sagging appearance. A thigh that is too small will cause straining (left), while a thigh that is too loose will cause excess fabric to bunch up (center). It should have just a small amount of rippling (right). When it comes to the thigh, you have two enemies: straining and bunching. If the trousers are straining or pulled taut across your thigh, there’s not enough fabric If excess fabric is bunching around your thighs, it’s too loose. Rather than falling totally flat, you want to see a small amount of rippling in the fabric. The ripples indicate that there’s still enough room for you to move normally without danger or rippage (note: if you’re opting for a slimmer fit, a very small amount of straining on the thigh gets a pass). 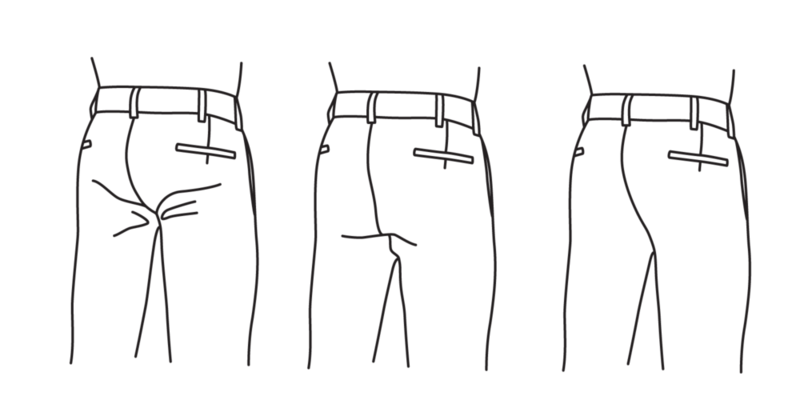 Taper refers to how much the trouser leg slims down from where the thigh ends and the ankle begins. For most people, the taper should get slimmer so that it isn’t hiding the shape of your calf entirely. But the taper has gone too far if the fabric is pulling or straining against your calf. A trouser leg that is too short will end an inch or more above the shoe (left) A trouser leg that is too long will "puddle" with excess fabric. 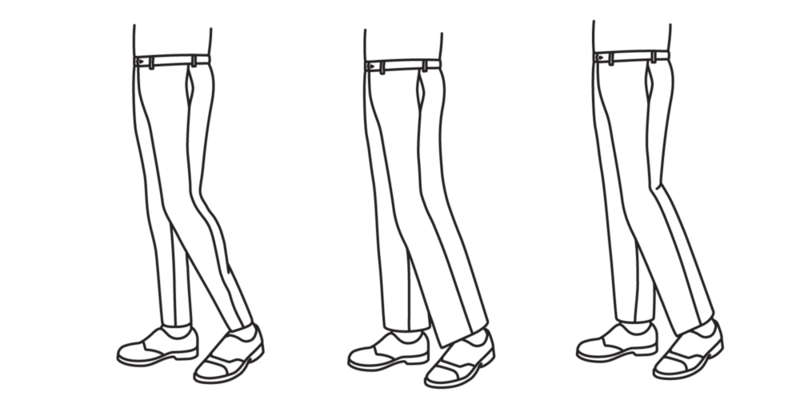 A trouser leg should end where the laces being (right). To get this one right, make sure you’re wearing the kind of shoes you usually wear with your trousers, like dress oxfords or loafers. The front of the trouser leg should break right where the laces begin, and the back of the trouser leg should fall on the middle of the back of the shoe. Take a look below while standing: are your pants hovering an inch or more above your shoes, or puddling over them with extra fabric? You want to avoid both those outcomes.